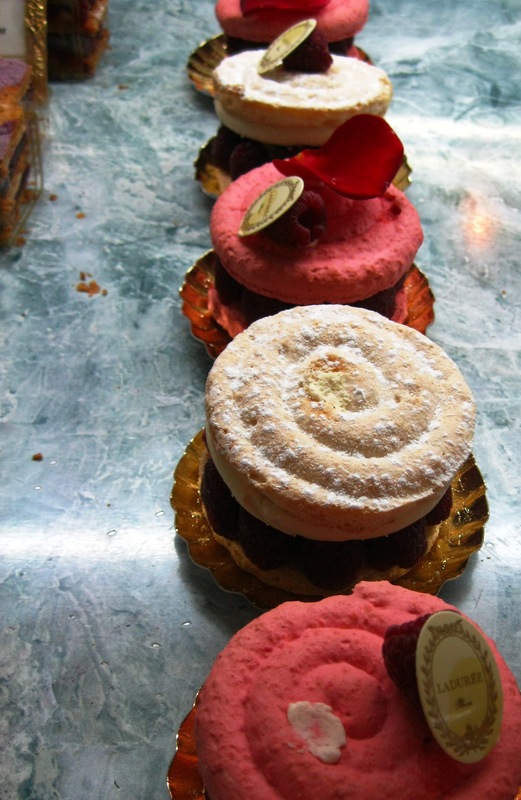 Do you remember how Marie-Antoinette relished gorgeous pastries made by Ladurée in Sofia Coppola’s film? 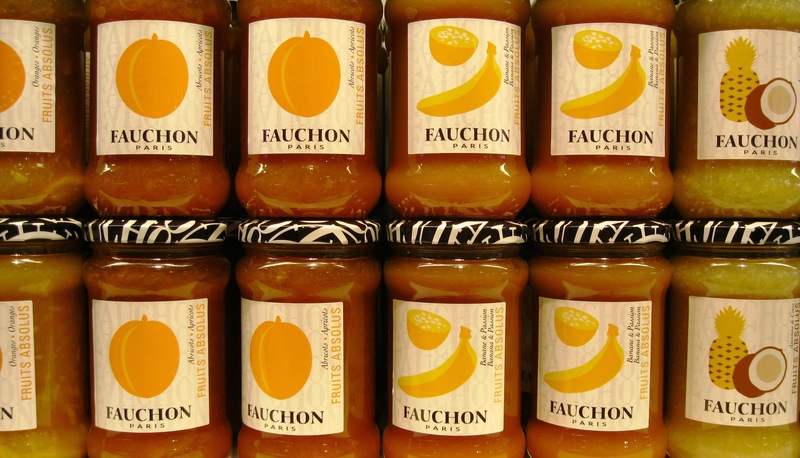 Whenever I’m in Paris, I always stop by the place de la Madeleine where the shop is located near famous luxury gourmet stores Fauchon and Hédiard. 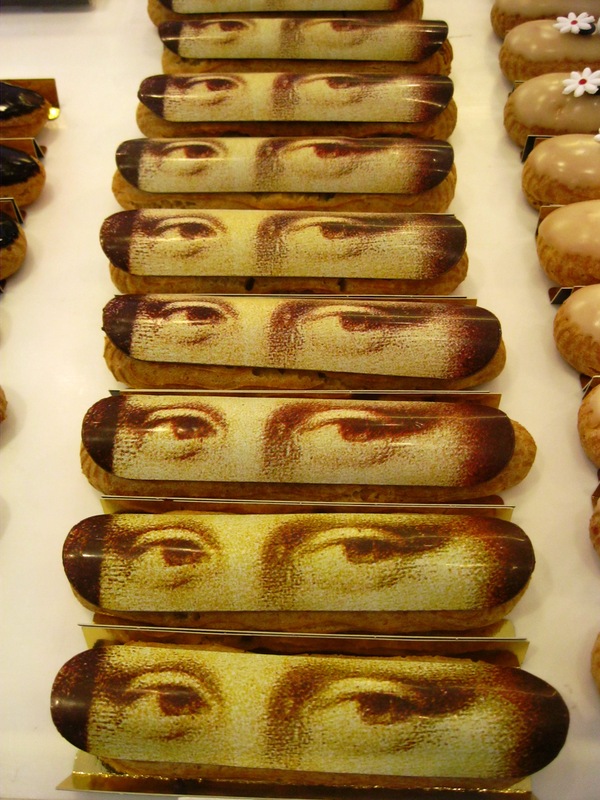 Lately I’ve been impressed by the effort these brands put in turning their pastries, packaging and displays into small works of art: each piece tastes good, no doubt, but it is a delight just to look at them, in the same way you would scrutinize a precious jewel in a shop window. It doesn’t help that I have a sweet tooth either. 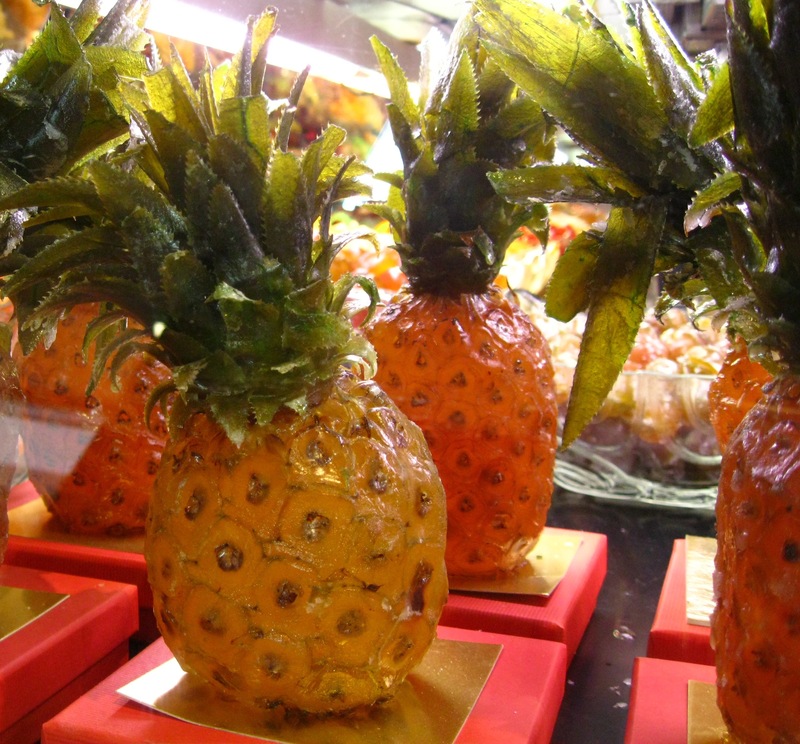 Do you have your dose of sugar for the weekend just by looking at these pictures? 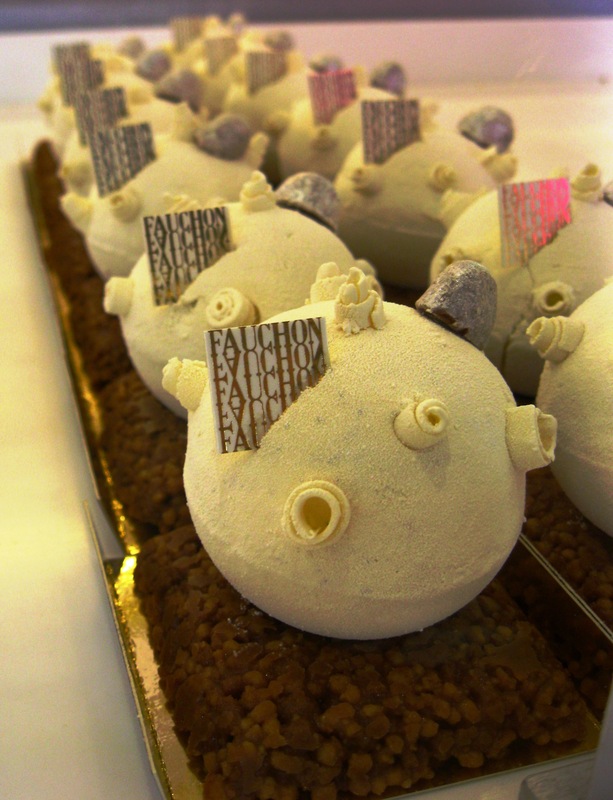 The cakes from outer space: I love how these pastries from Fauchon look like planets with tiny volcanoes. 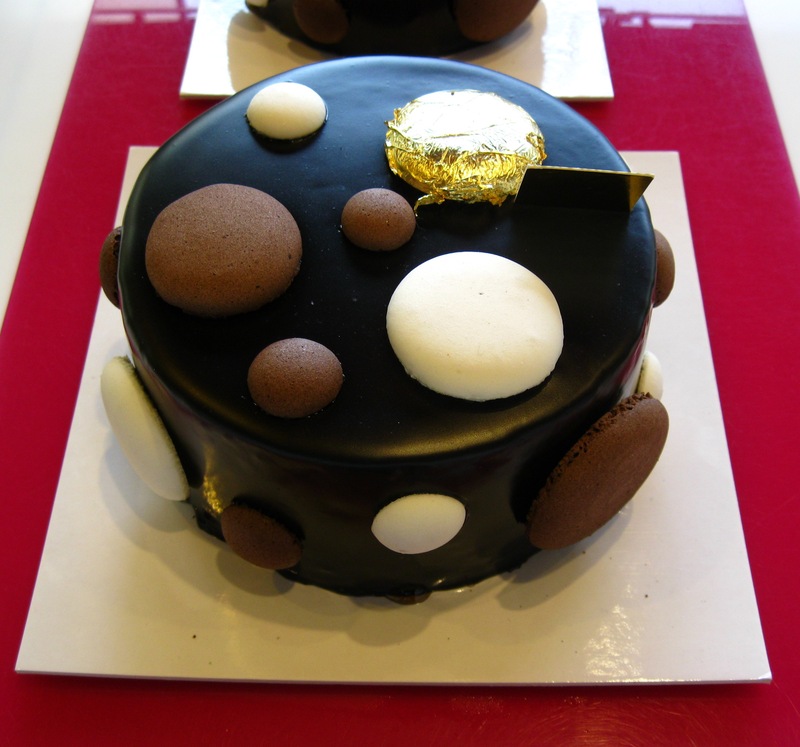 The bigger cake here has half-macarons applied on its chocolate surface. 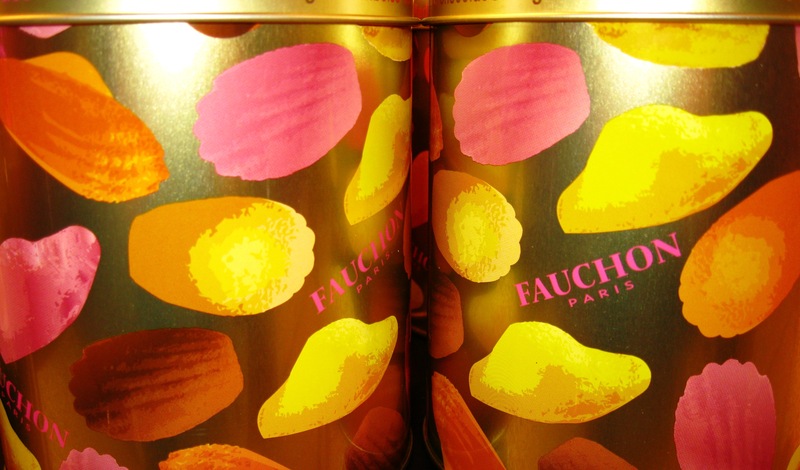 Fauchon is truly the specialist in éclairs. Aren’t these pretty with their cute white flowers? Mona Lisa is watching you. 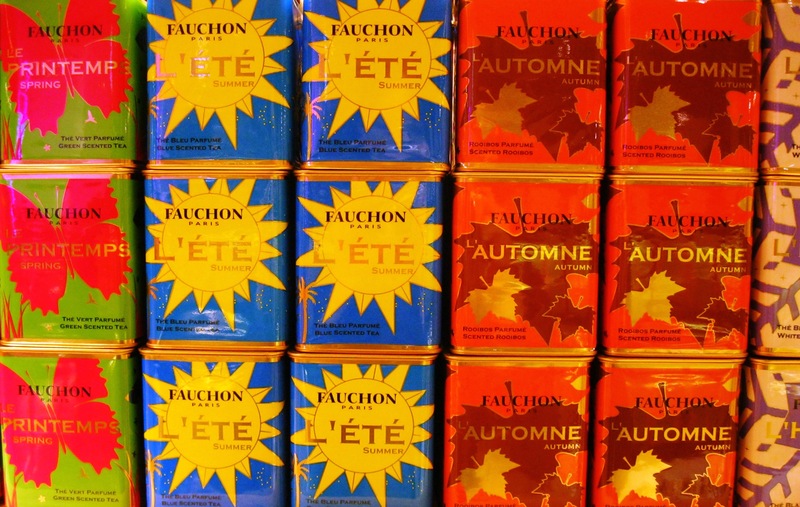 I love the bright, saturated colors of the packagings. They make you want to buy something just for the box. 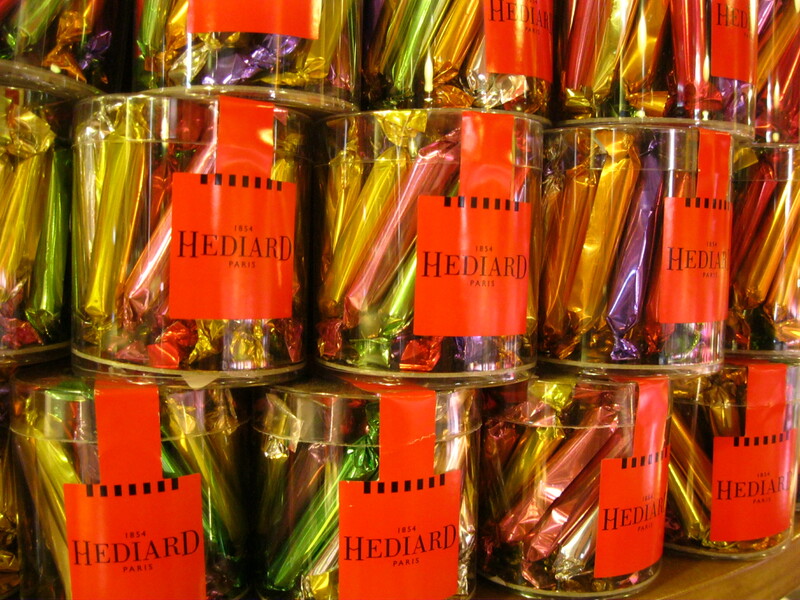 Don’t these Hédiard calissons look like this is a picture of a clutch bag? 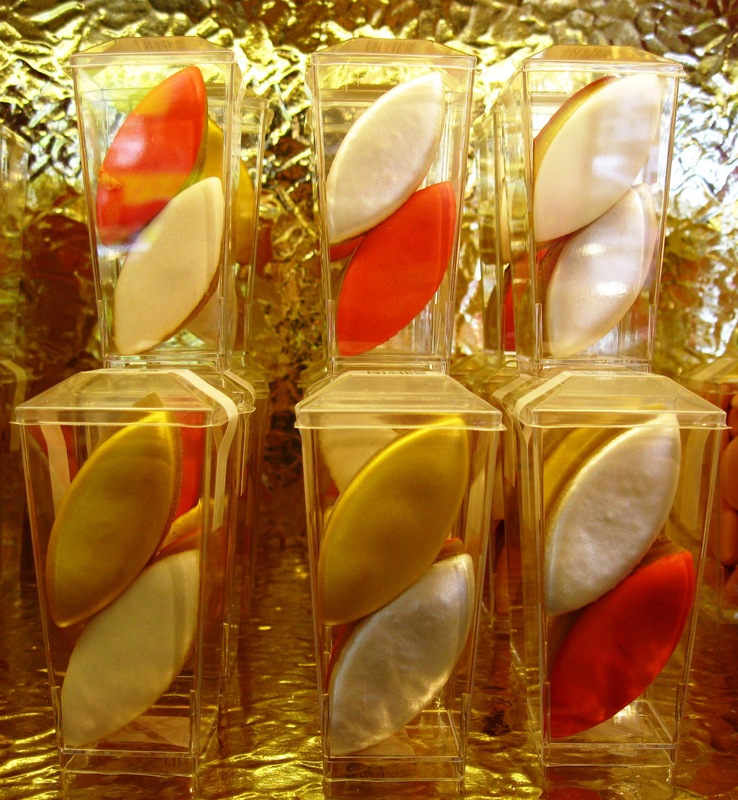 And here they look like sushi. 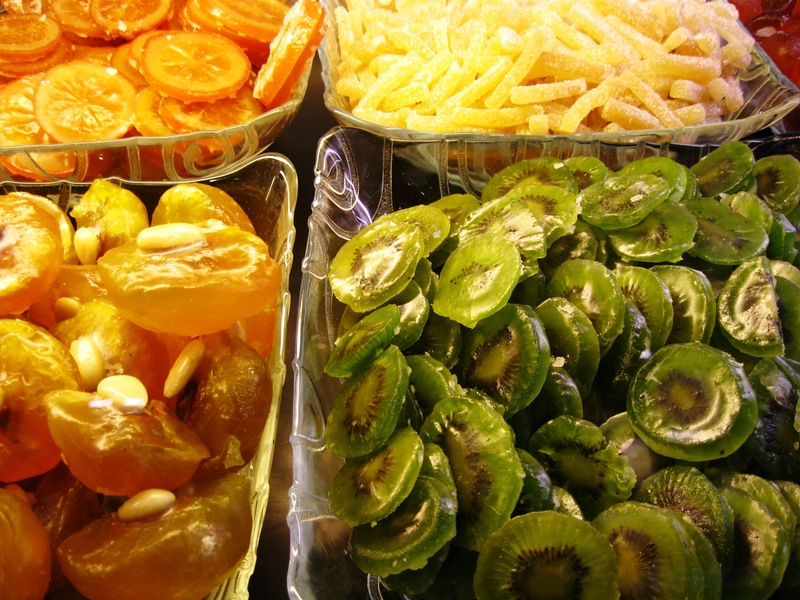 Hédiard candied fruits: pears, pineapple rings, mandarins, cherries, oranges and kiwis… Would these make kids eat fruits more often? 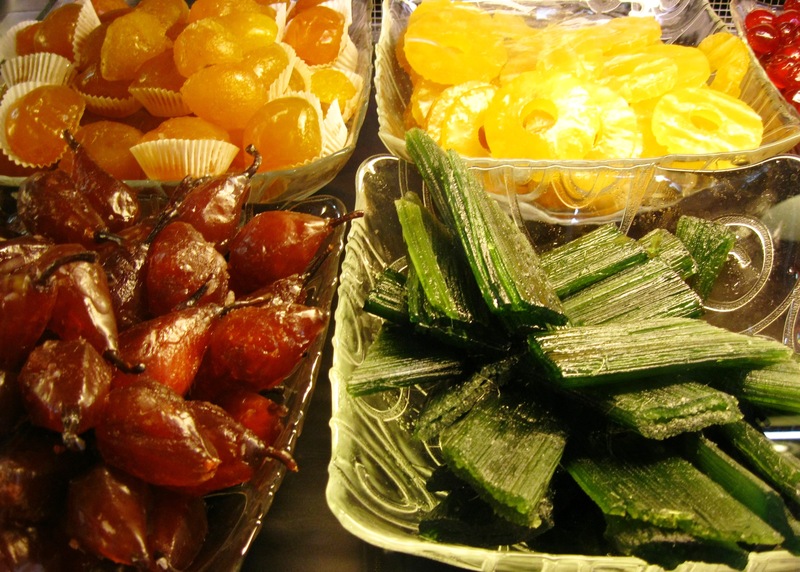 The condensed version: fruit jellies. Here’s a tip: if you ask the Hédiard salesman politely if you can take pictures of the store, he will gladly offer you one of these. 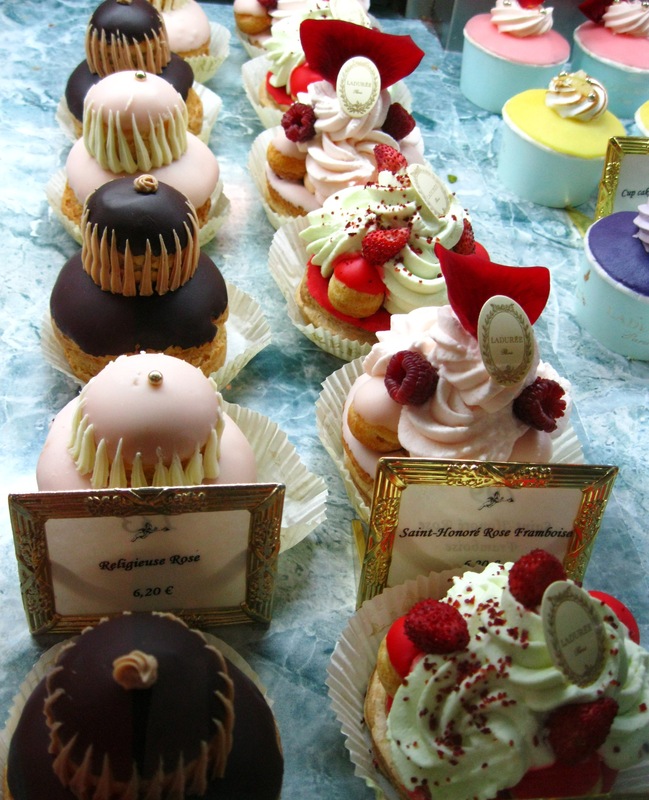 Calling the Ladurée cake army. 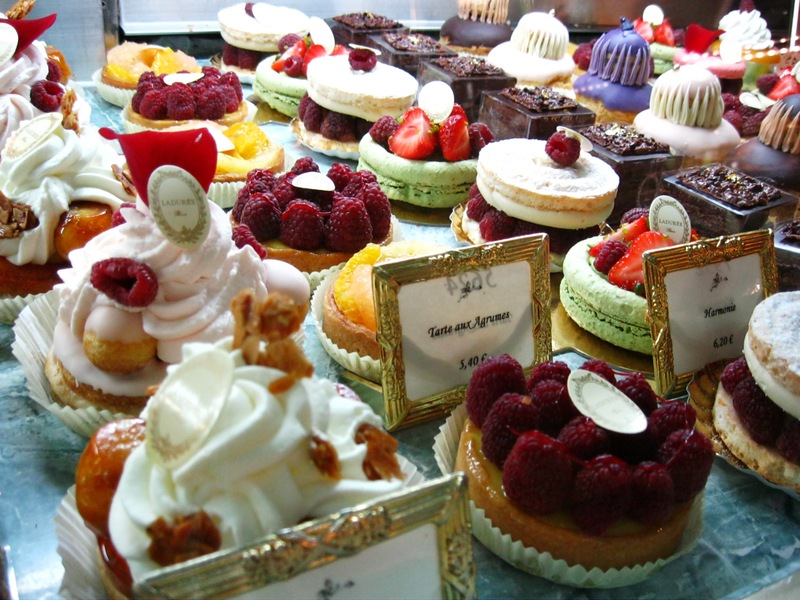 In France we call the pastries on the left “religieuse”, which means “nun” in English. A small head with a large body. Vous rappelez-vous Marie-Antoinette raffolant des pâtisseries conçues par Ladurée dans le film de Sofia Coppola? 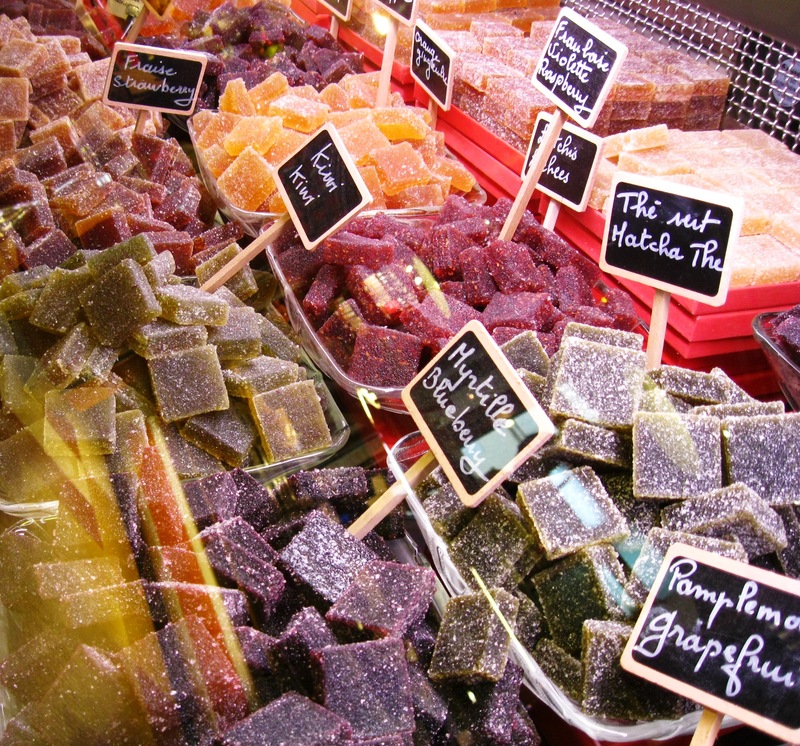 J’aime prendre le temps à Paris de passer devant leurs vitrines ainsi que celles de Fauchon et Hédiard place de la Madeleine. Récemment j’ai été impressionnée par le soin apporté à la présentation de leurs gourmandises comme de véritables petites œuvres d’art. Tout est fait pour satisfaire le palais, sans aucun doute, mais se promener dans ces boutiques est d’abord un délice pour les yeux. 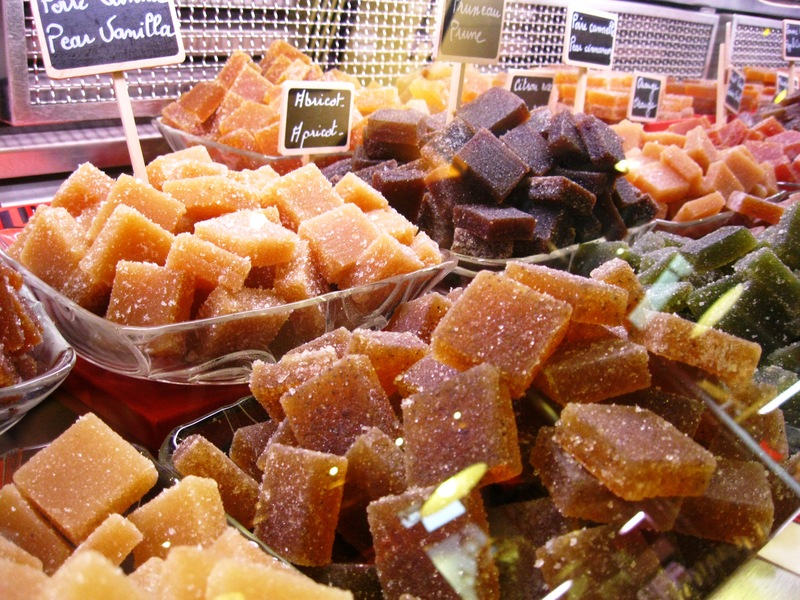 Avez-vous eu votre dose de sucre pour le weekend rien qu’en regardant ces photos ? 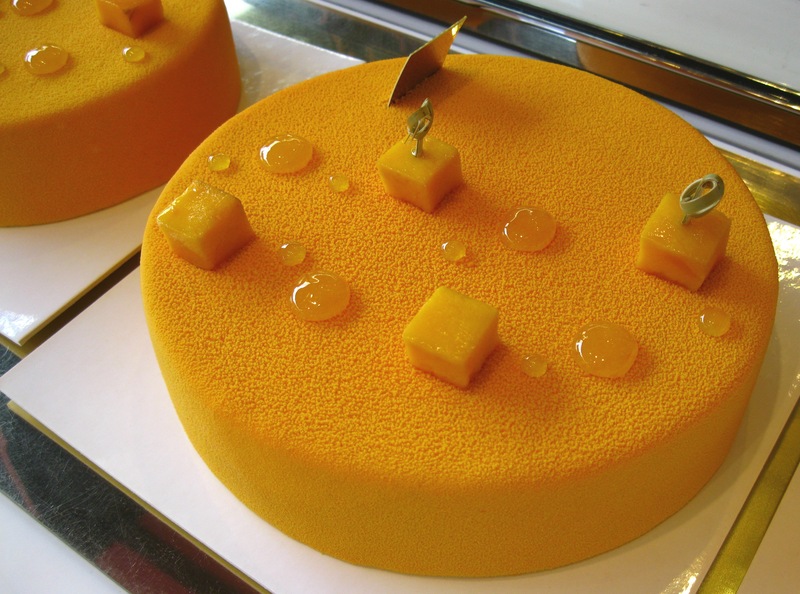 Pour les inconditionnels, Fauchon célèbre l’éclair les 9, 10 et 11 septembre avec 50 déclinaisons de cette fameuse pâtisserie. 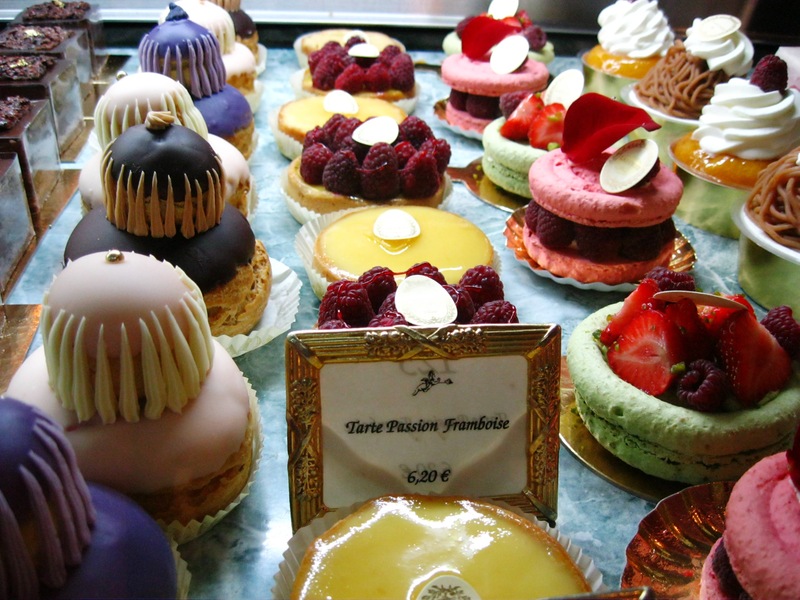 Ahh, there’s nothing like the Paris patisseries – they are all like gastronomic art galleries! If it weren’t for my waistline I would happily eat there every day. They may not be as beautiful, but I envy the scones you have in England! Haha you have to come back! Thanks for your comment. 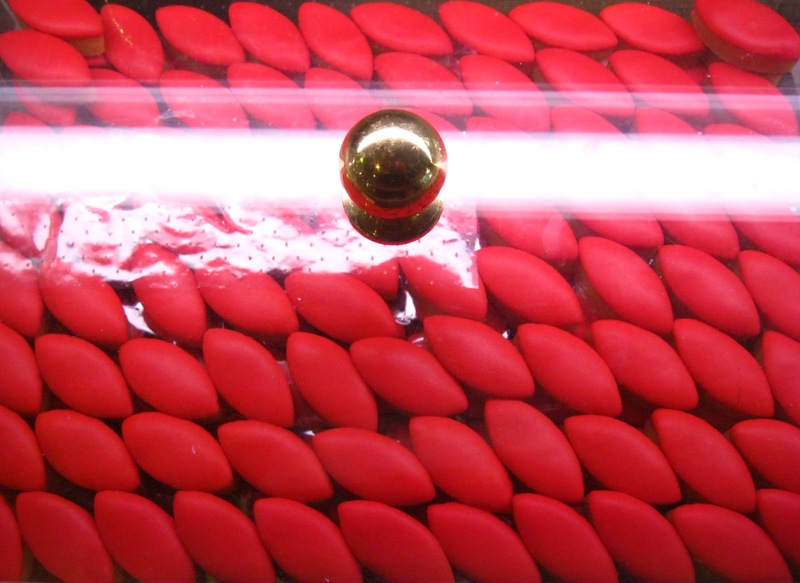 Yes, the staff at Fauchon and Hédiard was so friendly, but at Ladurée they asked me to stop taking pictures as soon as they saw my camera and looked really pissed. I love visiting Ladurée when I am in Paris, it’s heavenly. I think their boxes are really pretty and collectable as well, I’ve three at home that I store small things in. Ohlala, tant de douceurs pour l’heure du thé ! Ca me donne faim ! How beautiful, so colourful and happy! 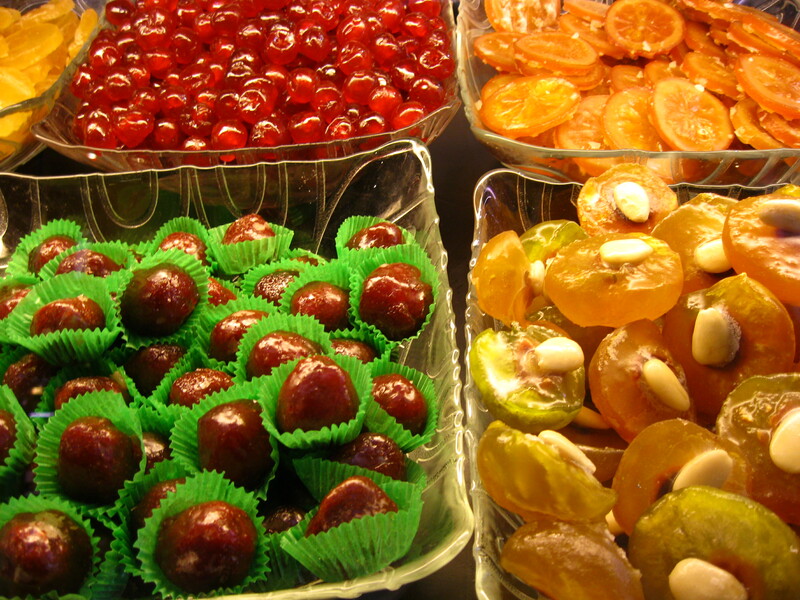 Oh my, I’m on a sugar high just by looking at these beauties! 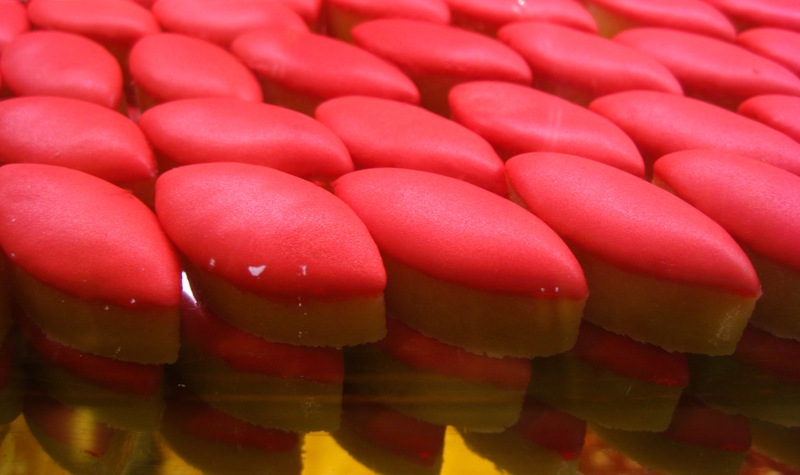 I’ve only been to Paris once, and I fell in love with macarons – and many other delicious treats. Speaking of macarons, I bought a box from Pierre Hermé (rue Cambon in Paris) a couples of days ago. Mmmm, I wish I had an endless supply, they are the best! 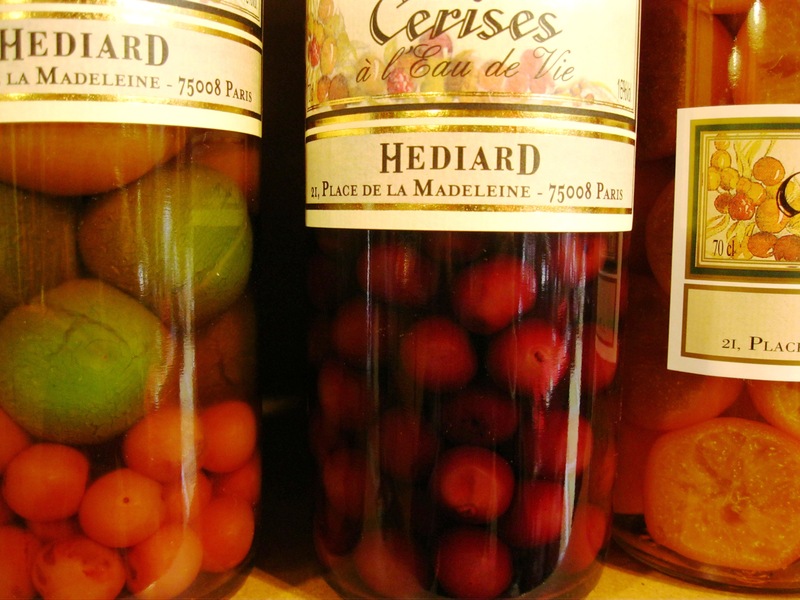 You have to try them out if you go back to Paris. This post makes me smile:) It’s wonderful start of my sunday. Many thanks for giving me the link, dear ritournelle, I love this post! The photos are sublime, you have done these eadible works of art true justice. Love your writing too. Have a great weekend! Nice to see you here MaiTai; thanks for taking the time to stop by and for your comment! Have a great weekend too! 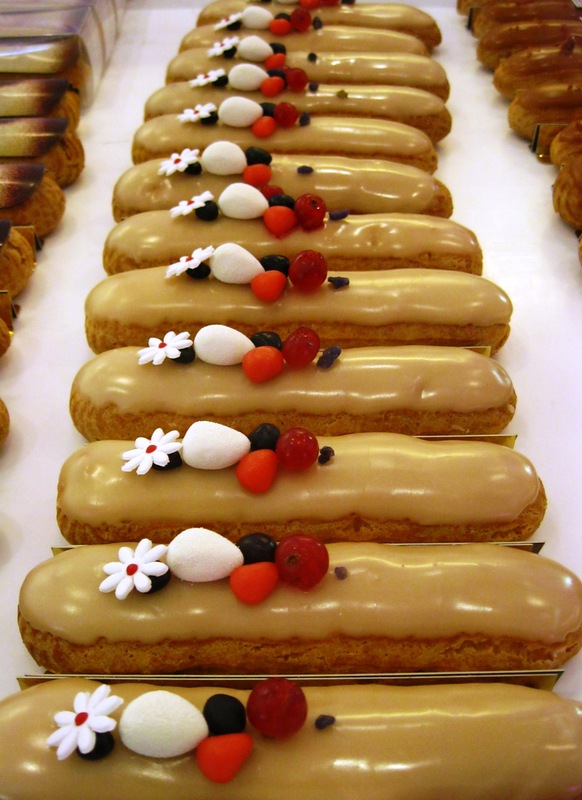 I just replied to your email :-) Your cakes look so good, you make me long for French pastries! Thanks Ritournelle, I would advise you to purchase their book ” Ladurée Sucré” ,green tea cover…their recipes are fantastic and do work very well. For example , I never made a Crème Patissière before, and it turned perfect, even my husband who’s a former Chef is amased. Actually my mom has this book. I never tried anything out of it because I thought it would be complicated, but I’ll take your advice next time I’ll go home! Simply gorgeous photos – some of the best I’ve seen yet.